This article covers step by step process of creating a video or movie from your photos using Microsoft’s Windows Movie Maker. 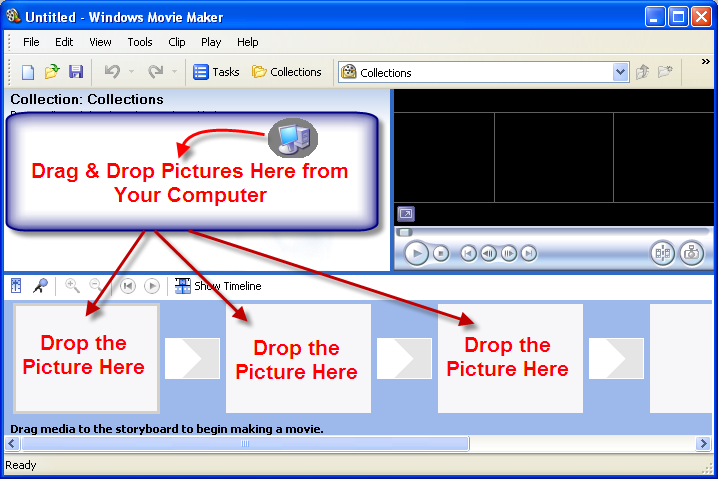 Open Windows Movie Maker and open your photos in a separate explorer window. 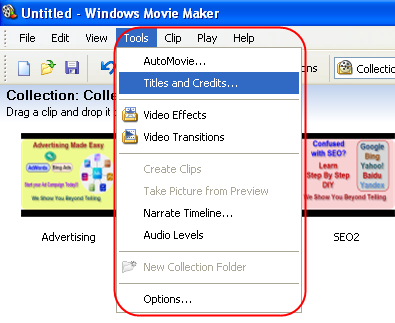 Select all you pictures, drag and drop into the “Collections” area of movie maker. You can also use the menu “File > Import into Collections” to add your pictures. Drag individual photos into the timeline photo box as per the sequence you need. The preview pan will show the preview of the photos in the timeline. You can change the sequence of the photos any time before saving to a video clip. After the photos are added to the timeline, the next step is to add effects and transitions to your photos to make it a lively video. 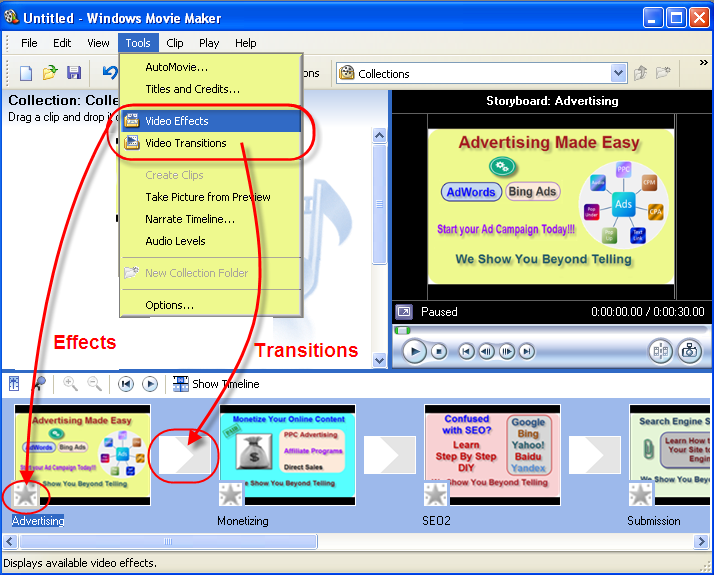 “Video Effects” and “Video Transitions” options are available under “Tools” menu. You have plenty of effects and simply drag and drop any effect image on the required photo. Same manner drag and drop the transitions into the area between any two images. The preview can be seen instantly in the preview pan to get the look of the effects and transitions. Want to add a sound to your video? Well, its simple and again just drag and drop an audio file in the “Collection” area or use menu to import an audio file to your collections as explained in step 1. Toggle the button from “Show Timeline” to “Show Storyboard” to see the detailed view of your movie. 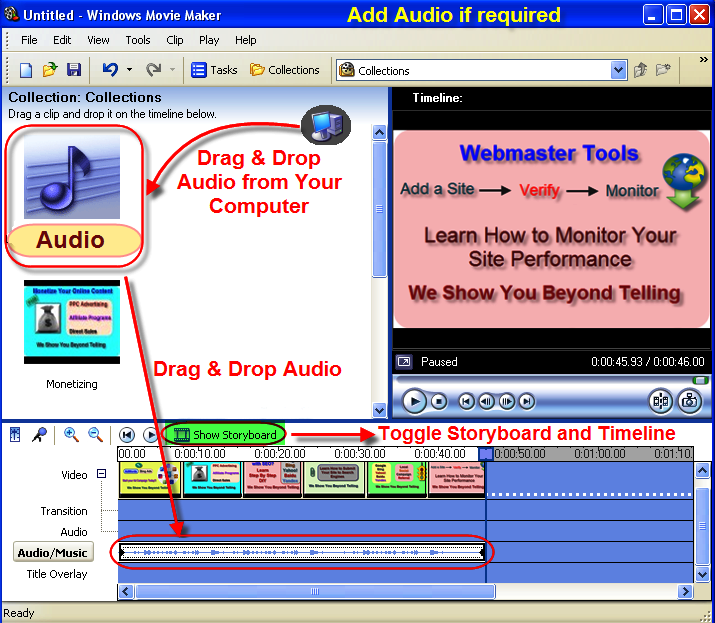 Just drag and drop the audio to your storyboard to enable audio. Adjust the time duration of the each slide, transition and audio length by clicking and dragging the rear end of each element. You also have an option to narrate your video with your own voice. 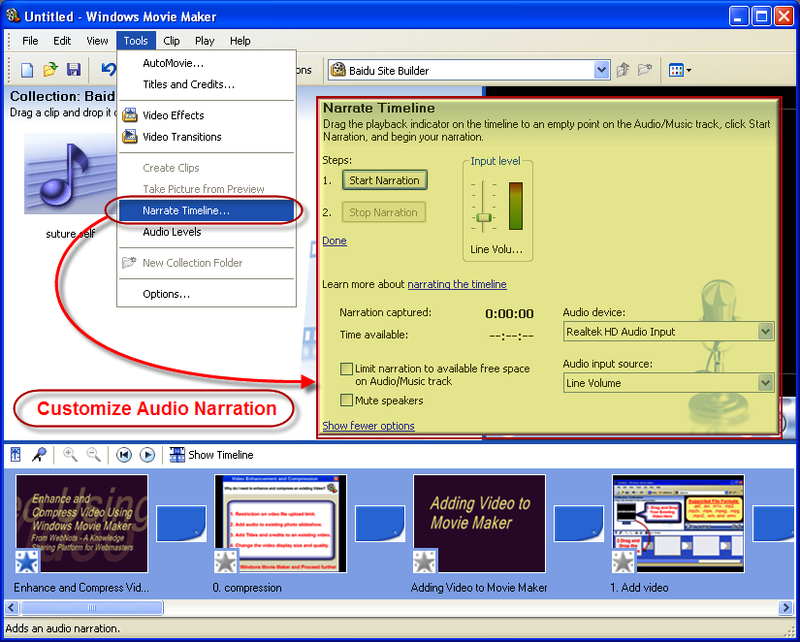 Go to “Tools > Narrate Timeline” and customize your settings for narration as shown in the below picture. Now your movie is ready and the last step before saving is to add titles and credits to your movie. Click on “Titles and Credits” link available under “Tools” menu. You have plenty of options to customize titles and Credits separately including setting font and background color. Add titles between any slides and check the preview of your movie before saving. The final step is to save your movie file. 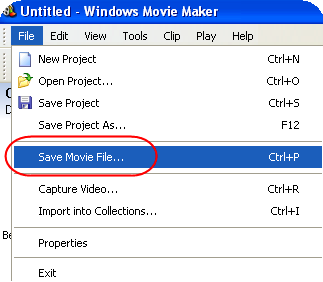 Go to “File” menu and select “Save Movie File..” option. You can save the movie in your local computer or send it in a email as an attachment or directly upload to a web server. During saving your video you have an option to choose the video quality suitable for your requirement which will affect the size of your video. Below is a sample video created with Windows Movie Maker.